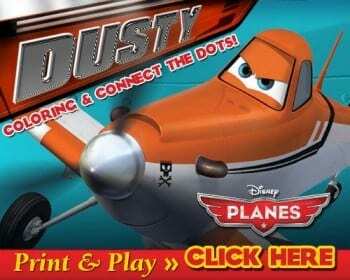 New FREE Disney PLANES Printables: Airplane Connect the Dots and Coloring Pages! Hooray! I just received some some super-fun and official Disney PLANES printables! Print the coloring and connect-the-dots sheets for your little ones, and get ready to see the movie in theaters on August 9th! My son is so excited to see PLANES–he wants to watch all of it every time a trailer shows up on one of our own Disney DVDs. He's also a huge fan of connect-the-dots, so I think these Disney Planes printables will be a big hit! As a huge fan of cartoons and movies intended for children, I really do think the movie looks pretty cute and funny. I'm sure it will be just as much of a hit for adults as it will be for kids! See more Disney's PLANES details: If you want to get caught up on all the existing Planes details, you can read about the Planes voice cast and see a Disney Planes trailer, too! From above the world of Cars comes Disney’s Planes, an action-packed 3D animated comedy adventure featuring Dusty (voice of Dane Cook), a plane with dreams of competing as a high-flying air racer. But Dusty’s not exactly built for racing—and he happens to be afraid of heights. So he turns to a seasoned naval aviator who helps Dusty qualify to take on the defending champ of the race circuit. Disney’s Planes takes off in theaters on Aug. 9, 2013. Disney's Planes is produced by Traci Balthazor-Flynn and executive produced by John Lasseter. Thanks! I just printed all of them for my little boy. He practically jumps out of his seat every time we hear anything related to airplanes. I think he’s going to die when he sees this movie! Fun! We like these disney sheets you make for us. Thank you! Disney actually makes them–I always just want to share them with you 🙂 I’m so happy you like them!